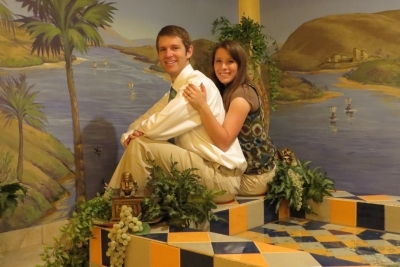 We just wanted to share a few thoughts and some fun pictures from our 2012 Couples Photos contest winners Trevor and Danielle! We just wanted to thank you so much for the gift certificate to the Anniversary Inn for the photo contest. It was truly the retreat we needed because we had just spent 6 weeks studying 12-16 hours a day straight for our first set of medical board exams. We went up to Utah and were able to spend the night at the Logan Anniversary Inn on our 6-month anniversary thanks to you! We took a tour there beforehand and all the rooms were amazing and the detail in each was so incredible. We stayed in Nefertiti’s Court and thought it was a really beautiful room, with the reflecting pool, Egyptian hieroglyphs/statues, and the huge jacuzzi tub with different colored lights! It was a fun get away! It really felt like we were on a secluded island. 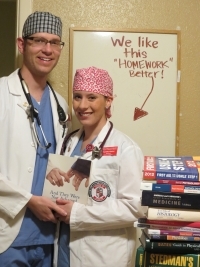 Our marriage has been super amazing, especially after studying your book during our engagement and marriage. We could not be happier and have a very full, rich relationship in all aspects and are so grateful to have started it out right. We purchased 4 copies of your book to give away to our friends at their bridal showers because it meant that much to us. Thank you so much for keeping marriages strong and for the generous prize! We were so lucky to receive and enjoy it! Thanks again! Here are a few pictures from our getaway to The Anniversary Inn! 2012 CONTEST WINNERS — Click here for the 2012 Couples Photos Contest winner information and photos. 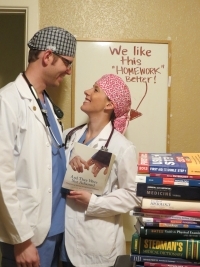 2013 CONTEST INFO — Click here to see this year’s 2013 Couples “Kissy” Photos Contest details! COUPLES PHOTOS PAGE — Click here to see all Couples Photos entries on our StrengtheningMarriage.com Couples Photos Page! 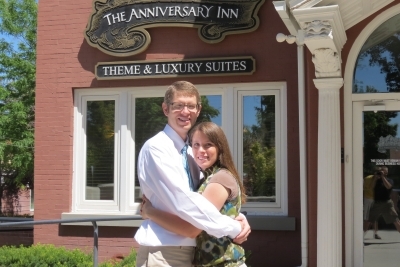 THE ANNIVERSARY INN — Click here for info about our 25% off Anniversary Inn discount and lots of fun Anniversary Inn pics! COUPLES PHOTOS POSTS — Click here for all of “Laura’s Strengthening Marriage Blog” posts related to our past Couples Photos contests!